The Amazing Adventures of Kavalier & Clay (2018 Folio Edition, originally published 2000. 632 pages 10˝ x 6¾˝) is a novel from American novelist Michael Chabon. Chabon is a multi-award-winning author. This novel won the Pulitzer Prize for Literature in 2001. There are few things more difficult for an adult than truly coming to terms with who they are, content in their skins. For those that cannot achieve this goal, escape often seems the best route. There is a rich vein of escape which runs through the entire novel and it is not by meagre chance that the two enterprising comic book creators give birth to their most popular character, The Escapist. The two discover that sometimes running away can have tragic consequences. When Kavalier flees his Nazi-occupied home, things do not go as planned and rather than face his family and what he perceives to be his own failure, he turns to an old friend and mentor to get him out of the country. In Brooklyn, Sammy is also dreaming of escape, but this time it is from the life he knows into a world where he is a comic book creator. Their experiences of creating comics mirrors the experiences of real comic creators. Regardless of the quality of the work, the creators rarely saw the true profits of their labours. This continued to be a bone of contention, in the real work, like when Jack Kirby tried to get his original artwork back from Marvel in the 1980’s. The two create ‘The Escapist’ a combination of Sammy’s desire to create superheroes and Joe’s love of magic. The character proves enormously popular. However, their character is heavily anti-fascist, reflecting Joe’s inner turmoil and guilt. In his private life Joe falls in love and appears at parties, all the while trying to escape his guilt for leaving his family behind. Sammy, also, struggles in his private life. Homosexual, at a time when it was unacceptable, his quest for happiness against the possible pressures of society and his Jewish heritage, Sammy must make a choice between happiness and acceptability. Although fiction, the book draws a lot from both real people and real situations, which gives the novel an air of authenticity rarely achieved when discussing comic books. The book is contained in a black slipcase with a key motive. 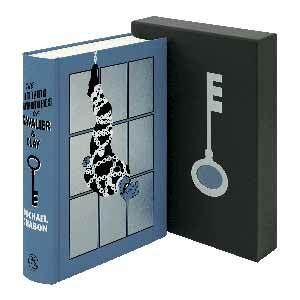 The die-cut hole in the keys head lines up with the depiction of ‘The Escapist’ on the novel. 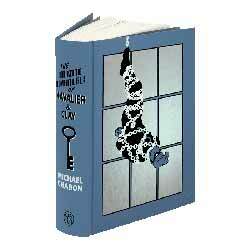 The book is predominantly blue with an illustration of the Escapist in silver, blue and black on the cover. There are ten illustrations, six of which are double page spreads, illustrated, in colour, by Chris Samnee, with colours by Matthew Wilson. The lettering on the spine is a combination of a thirties Buck Rogers font with the characters names thrown into sharp relief, which looks quite striking in the book case. The book is bound in blocked coated paper and the text is set in Utopia, with Scriptorama Markdown display. There is a new seven-page introduction from Michael Moorcock. One of the real strengths of Chabon’s writing is the meticulous research. It grounds the story of Joe and Sammy in a realistic slice of pre-war America, where the pair of dreamers battle through their hopes, secrets and demons, always tempted to literally or metaphorically escaping.